With the rapid construction of luxury high-rises amidst the newly built Whole Foods Market, Boston’s historic Chinatown is fighting for its life, according to a recent Boston Globe article. In the thick of these evolving changes, the Friedman Justice League is making a push for the Friedman School to support local Asian businesses and gain a better appreciation of the culture in which the school is situated. Ask any student who began taking classes prior to 2012, and they can tell you about the rapid changes that have happened since then. Between the pristine doorman-manned condos developed on Kneeland and Washington to the Whole Foods on Harrison, the changes are well underway and pervading local lifestyle. People often joke that the development of a Whole Foods (aka “Whole Paycheck”) in a once dilapidated neighborhood is a telltale sign of gentrification, and Chinatown will likely follow suit. These most recent developments are not the first to threaten historic Chinatown. When I-93 and the Massachusetts Turnpike initially cut through, roughly 1,200 units of housing were demolished, and the expansion of Tufts University and Tufts Medical Center additionally took over one-third of the land area in Chinatown. 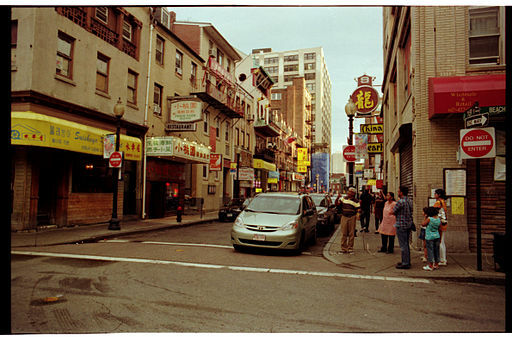 As described in the Boston Globe article, however, there is a scramble to preserve the historic Chinatown of Boston. Home to about 4,400 residents, 77% of which are classified as Asian according to the Boston Redevelopment Authority, Boston’s Chinatown is one of the largest in the United States. Organizations such as Chinatown Land Trust are in the process of trying to buy row houses on Hudson Street to set aside for working class families in an effort to prevent rent spikes and maintain current residents. Boston’s housing chief and director of the Department of Neighborhood Development Sheila Dillon is also in the fight to save row houses in the organization’s commitment to preserve the historic Chinatown neighborhood. While some could argue the placement of the Tufts Health Science campus does not help stem the tide of gentrification, the Friedman Justice League (FJL) believes Tufts has a role to play in supporting the community it is a part of. Between 1990 and 2010, the percentage of college and post-graduate students taking up residency in Boston has increased from five percent to nearly one quarter. The FJL is working to include a tour of Chinatown as a permanent component of New Student Orientation, in which incoming Friedman students can be introduced to Chinatown’s rich history and culture and become aware of the local businesses to support. In previous years, the Chinatown tour has been offered through the FJL as an extracurricular activity for students through the Asian Community Development Corporation. Currently, members of the FJL are working with administration to examine the feasibility and student interest of such a tour, which is why your opinion is important! To provide your input on the idea of the integration of a Chinatown tour into New Student Orientation please complete the brief survey. The Friedman Justice League is composed of students in both masters and doctoral programs at Friedman. We seek to make our community more diverse and find ways to allow the Friedman community to better address issues of discrimination and oppression in its teachings, research, and programs. To find out more, visit our blog.